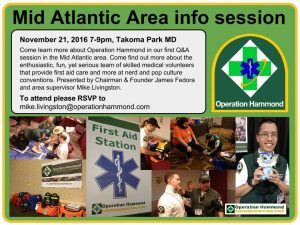 The date has been updated: Come learn more about Operation Hammond in our first Q&A session in the Mid-Atlantic area. November 21st from 7-9pm Tacoma Park MD. Come find out more about the enthusiastic, fun, yet serious team of skilled medical volunteers that provide first aid care and more at nerd and pop culture conventions. If you’re interested in learning more about our charitable mission and find out more about our movement be sure to join us! Presented by Chairman & founder James Fedora and area supervisor Mike Livingston. Previous: Previous post: Our Faygo Fundraiser is back! Next: Next post: Another Anime Con 2016 Faygo Fundraiser and More!